Have you already played Thunderdogs.io on Poki? Hey, remember Thundercats? The original animated show ran from 1985-1989, and became a bit of a cultural phenomenon at the time. We remember our Thundercats-themed lunchboxes and action figures. Those were simpler and better times, right? Okay, so you remember Thundercats. Did you ever wish the characters in the show were dogs? Did you ever wish it was a completely different show about dogs in combat aircraft, battling it out over cities and firing outlandish weapons at each other to vie for dominance? Did you ever wish it was an awesome game you can play on Poki? If you did, we can only credit you with the most overactive imagination known to man, and we have some excellent news for you. That’s right: your childhood dreams have come true. 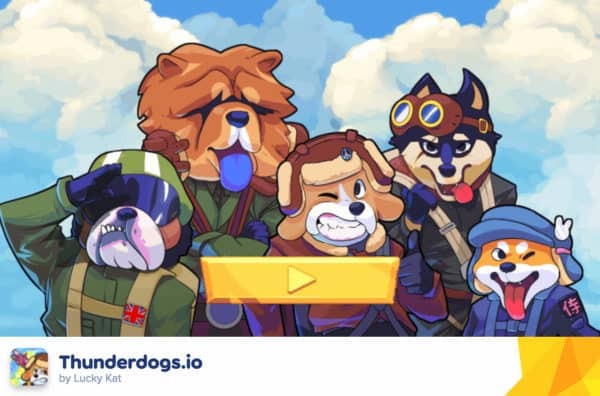 Thunderdogs.io is the new game from Lucky Kat Studios, a well-known and well-respected developer for mobile and web platforms. They’ve been responsible for several projects in the past, including the official Grumpy Cat game, Grumpy Cat’s Worst Game Ever. Theirs is a name that carries prestige and quality. Luckily, Thunderdogs.io absolutely carries that prestige name on its shoulders. The first thing that’s evident when starting the game up for the first time is just how much love has been poured on the visuals. Thunderdogs.io has a wonderful retro pixel-art aesthetic that reminds us of nostalgic tributes like Axiom Verge or Rogue Legacy, only with a day-glo colour scheme that’s reminiscent of something like Radiant Silvergun or Gunstar Heroes. Those visuals hide an incredibly solid, robust experience that combines the best elements of .io games with multiplayer shooters and dogfight simulators like Ace Combat or War Thunder. Essentially, Thunderdogs.io is a game about shooting down other players and collecting the bones they leave behind. It shares this mechanic with its .io brethren to a certain extent; many games like Slither.io and Paper.io task the player with collecting or dominating the map as much as they can, while ensuring enemies don’t get the drop on them. Where Thunderdogs.io differs from its more conventional cousins is in its execution. 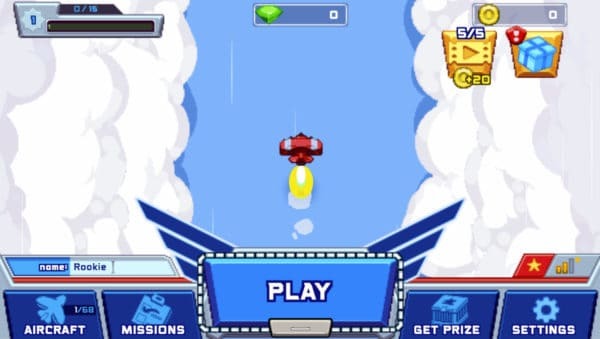 Thunderdogs.io is mostly focused around combat; rather than players simply colliding into one another in order to establish victory or defeat, this game revolves around the player’s plane, which is controlled with the arrow keys and equipped with a variety of increasingly colourful weaponry. The movement controls here are fairly simple, and are established early on via one of the best and most useful tutorials we’ve seen in an .io game. Usually, these games don’t really need to be tutorialised, but the genius of Thunderdogs.io is that it includes a practice scenario within its tutorial which gets the player used to the idea of battling player enemies. The AI is sufficiently advanced that the computer-controlled planes are indistinguishable from players, so this is an excellent way to hone your skills. Unfortunately, this tutorial can’t be accessed once it’s finished, but the stakes for dying in a multiplayer match are fairly low anyway, so it’s not a big deal. Dogfights in Thunderdogs.io are gloriously messy affairs which see multiple players dropped into a map to chase each other around. Due to the relative permanence of .io games, there isn’t really “a game” which it’s possible to “win” here; rather, the goal is to last as long as you can before some young upstart comes along and destroys your plane. Along the way, you must collect as many bones from the wreckage of planes you destroy as you can. Each bone you collect will make you a bigger target for your enemies, though, so the more prestigious you are, the more ripe for the picking for other pilots. In order to become “top dog” (ahem), you must first master flying your plane, as well as the weaponry it commands. The flight controls consist of the arrow keys, and only the arrow keys: up arrow grants you a short boost of speed to evade pursuers or chase down stragglers, down key brakes in case you’re headed for disaster, left and right arrow keys turn the plane. 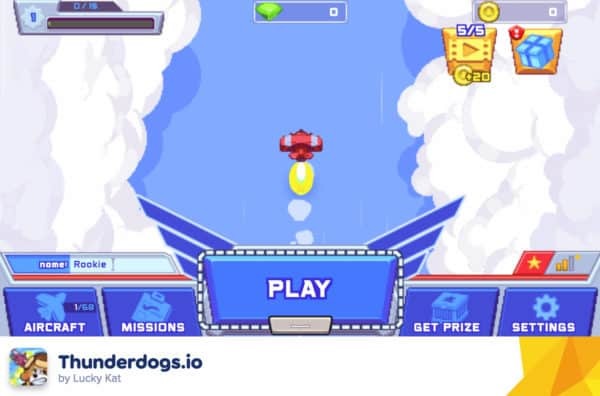 It’s important to remember that your plane in Thunderdogs.io is in constant motion; you don’t control the acceleration of the plane, only when it stops. These controls can be a bit difficult, and they do lead to some hilarious moments early on, like when we encountered a fellow erstwhile pilot banging repeatedly into a wall, presumably unable to figure out how to control their plane. We spared that pilot’s life out of pity only to be shot down by them moments later. See if we’re as merciful next time. The difficulty of the controls does give way to an increased feeling of mastery later on, but it’s not a super-easy game to control with the keyboard; there is a slight feeling that the mouse would have been a better option. That said, flight still feels great in Thunderdogs.io, especially when you get the hang of it, as you will if you play long enough. Weapons are great fun to use, too; there’s a host of artillery on offer, which can be picked up as battles progress, as well as your plane’s trusty default cannon. Firing on enemy planes always feels joyous, and there isn’t a secondary targeting control, so you’re literally limited to the direction in which you’re facing. This limitation works in the game’s favor, as it increases the skill ceiling, ensuring you’ll always need to be sure of where you’re firing before you take the shot. In addition, because most of the game’s weapons are temporary, wasting a laser cannon shot (for example) feels disappointing, so you’ll want to save it up until you’re sure it can take out multiple enemies with one satisfying blast. 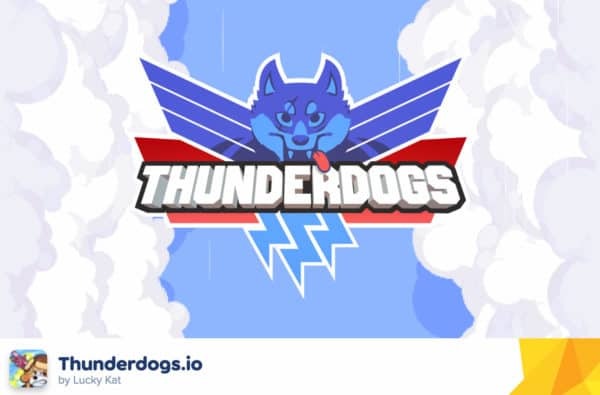 There’s a whole lot of fun to be had with Thunderdogs.io, but you’ll need to have a taste for multiplayer action and a desire not to dig too deeply. 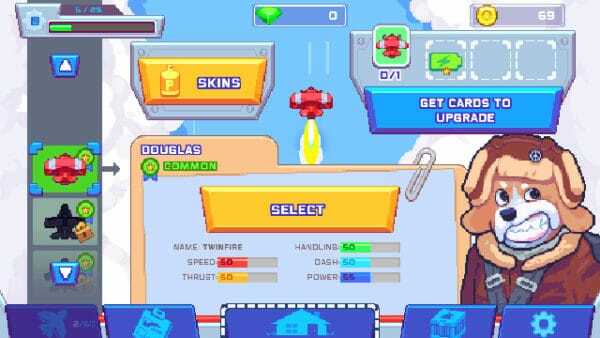 The controls, weapons and unlockable planes and perks do add a layer of depth to Thunderdogs.io that’s missing from most .io games, but it’s basically a romp for which the controls and feel of the weapons are their own reward. That’s not a criticism, though; sometimes, all you want to do is play as a dog shooting other dogs down in their dog planes, and Thunderdogs.io delivers in spades.